"You have inspired our people to look within themselves for change and to be happy"
Dr. Melissa Luke is a published author on careers and a professional speaker who trains minds in performance excellence. She specializes in career satisfaction and happiness. Dr. Luke’s thoughts on customer service, leadership, corporate games, career satisfaction, and the educational system have been seen/published on Fox News, Forbes, The Huffington Post, Salem Communications, Educational News, The Chief Learning Officer, Alister & Paine, BLR, the American Management Association, and many other nationwide media outlets. Dr. Luke collected hobbies as her primary career for many years. She was certified as a scuba diver and understands just enough to be able to accidently drown herself. She also has a private pilot’s license, and is an equally poor pilot. Unfortunately in a misguided moment, the SCCA certified her as a racecar driver as well. After wrecking the car Paul Newman used to become a successful racecar driver, it seemed prudent to ask if Dr. Luke was good at anything. Dr. Luke then continued her quest in pursuit of the perfect career, which included opening one of the first online trading floors in the US, accepting interim CEO positions, working for the US Treasury, lecturing for Ph.D. students, consulting as a Sr. Business Analyst, and selling Mormon Crickets…the latter was the most interesting but was highly unsuccessful. Fortunately Dr. Luke was more successful in collecting and in understanding the dynamics that go into careers than she was at collecting hobbies. She now shares with audiences the secret formula of success--one that every company in the world needs to know and to practice. Dr. Luke now speaks globally on how to accomplish almost any task. She has been training corporations in these methods for more than a decade. 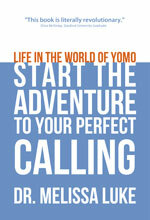 She is the author of “Life in the World of YOMO; Start the Adventure to your Perfect Calling”. The team working with Dr. Luke will assure a successful event with a 100% satisfaction guarantee. To come through with that promise, we will acquire the slowest rental car possible for Dr. Luke, will refuse to let her fly herself to any engagement, and will have hidden her scuba diving equipment to avoid any unfortunate activity. We are not responsible for her when she is sleeping. It is our hope that all event coordinators will provide hotel accommodations that are comfortable and will keep her out of trouble. Dr. Melissa Luke is a professional motivational speaker with a very clear mission: Train today’s minds for career excellence. Her message has reached audiences totaling in the tens of thousands and she has spoken in front of Fortune 500 executives, hospital staff, police departments, municipal workers, non-proﬁts, universities, state agencies and the federal government. Dr. Luke is one of the few professional speakers on the circuit today whose goal is to truly reprogram the way people think. She is proactively dedicated to raising the level of thought in any organization for whom she works, and is passionate about changing how her audiences view their lives, their careers and their personal happiness. Dr. Luke not only works with corporations to eradicate job dissatisfaction, but she also visits universities across the country to encourage our youth to seek out professions they can develop a real passion for. .
As a published author, professor and corporate motivator, Dr. Luke promotes career satisfaction through the science of Human Analytics. That’s right—a science that studies how to motivate people. Human Analytics is also taught by the Harvard Business School and is implemented by successful organizations across the globe. Melissa uses this method to empower executives and managers to increase employee morale, heighten productivity and maximize profitability. Dr. Luke’s natural charisma and impressive background in business, combined with the proven, innovative techniques she uses, will guarantee any audience a memorable and life changing performance. They will leave with the tools and inspiration to use a game driven structure called the 45 Day Challenge, which will optimize their professional performance, will greatly benefit the companies that employ them, and perhaps most importantly enrich their personal lives. Back to fun…check out the demos below or in the media tab. Click to explore the book!